What Will Kairi's Role Be In KH3? What do you believe will be the role Kairi will have in the inevitable Kingdom Hearts III? Will she be a D.I.D. (Damsel In Distress)? A team member in Sora's group (like Xion and Roxas)? Will her status as a PoH (Princess of Heart) have any importancein the plot? Re: What Will Kairi's Role Be In KH3? I think a team member. ^^ I can see her and Riku replacing Donald and Goofy as Sora's teammates. I also believe she might become a mage character. =) Magic seems like it would be more her forte than anything else. Agreed. If she keeps the keyblade, or gets a different one, I think she'd be like Aqua. I agree, it suits her. In fact she's magic skilled in my fanfic series. She's set to have a duel of magic against Maleficent towards the ending of my first fanfic, and Madam Mim in the third entry of my fanfic series. There's other fights, but those are the two I like the most. Sometimes I feel like I'm the only person who really wants Kairi to wield a Keyblade! For me, the weapon doesn't matter so much as the role in the story. Like, I don't mind that both Terra and Riku wield Keyblades, but it does seem like their stories are very similar, and sometimes that bugs me. On the other hand, I like the idea of SRK being the next TAV, and being the ones who finish what the old trio began with Xehanort. And on that note, I'm also kind of hoping that in KH3, Sora, Riku, and Kairi will each get their own scenario, and we could have the chance to play as Kairi while the boys are doing other stuff. It would give her an equal role in the story and stress her importance. And yeah, I'd also love to see her PoH powers playing a role, 'cause I love the Princesses of Heart! I feel the PoHs are an epic part in the KH series. I'd love to see them play a big role in the next installment. And Kairi learning to control her powers would be awesome!!! I think Sora for one would approve. Hey, yeah! Three-in-three! That's so cool! I almost want Sora and Riku to be all protective of Kairi at first and try to keep her from doing too much, because then she would get frustrated and she would only want to try harder. And that in turn might make her into a more skilled, useful member of the gang, at least in the eyes of everyone else. I could see that. But I think Sora at least already respects her as far as that's concerned. Donald: Kairi, you were great! 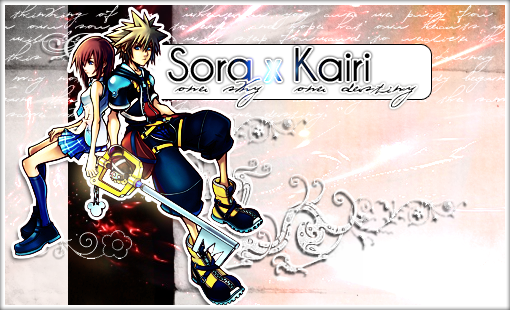 Sora: You are different Kairi, but I'm just glad you're here. That's another thing too- she got praised by Donald, of all people! Now THAT'S impressive! I think, if we do get separate scenarios for SRK in KH3, Kairi will go on a quest to discover exactly what her powers as a PoH are capable of, because when you think about it, they've been pretty vague on that topic so far.